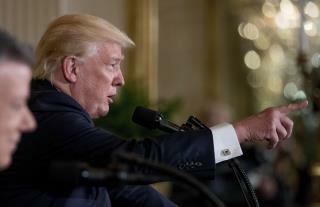 (Newser) – President Trump called the appointment of a special counsel to investigate his campaign's ties to Russia a "witch hunt" that "hurts our country" Thursday in his first public, non-Twitter comments on the situation. "I believe it hurts our country terribly, because it shows we're a divided, mixed-up, not-unified country," CNN quotes Trump as saying during a luncheon with TV news anchors. He placed blame on Democrats wanting to discredit his election victory. During a press conference later, Trump denied urging former FBI director James Comey to drop the investigation into Michael Flynn. He added that "everybody" says it's "ridiculous" to think he's done anything criminal, denying any collusion between himself and Russia. ...and all the dysfunctional $hit he's been up to the last 100 or so days doesn't? Sorry Donny, I think it just hurts you, and that's just fine. its only a matter of time now. as the facts come in, the trumpster will be on his way out. habitual lying is not a good policy decision.